@javits.javits: Hey Eli, thanks for coming! Under current FAA regulations are drones treated as a greater danger than bird strikes? If so, what's the reasoning on their side? Yes, the FAA is freaking out about drones even though there has never been an aircraft collision with a quadrocopter. I think it's just what happens when a safety agency comes across anything new. @thomas.jefferson: Is there any data to show the effect of a drone being ingested into a jet engine or hitting a prop plane? No collision test data, and it's never happened in the wild. I assume it would destroy the engine. Of course, that is not usually catastrophic because the planes we care about most all have multiple engines. Watch out for swarms, though! @fogg.mcmahon: I asked in one of the others--if my cell phone can mess with an airplane's electronics, does an RPA with a wireless connection pose a similar risk? I do worry about bad guy. Maybe the planes should have some A2AD capabilities? A laser? The thing about bad guys is that this tech has been available for a long time with remote controlled aircraft. No one has tried to use it for terrorism (yet, knock on wood). @fogg.mcmahon: And stupid people? Especially teenagers? As these things get cheaper, more people will have them and perhaps see them as disposable. Stupid Americans are a concern, but not one that is addressed by existing regs. Registration doesn't do any good if the drone is incinerated in an aircraft engine and you can't figure out whose it is. Best way to deal with mistakes by dumb pilots is to have onboard tech that prevents flying into restricted areas. Already being developed by manufacturers. @thomas.jefferson: Do you think drone users should have to have their UAS certified by FAA, or take an aeronautical knowledge test, like manned pilots do? If not, why should standards for unmanned fliers be less than stringent than standards for manned fliers? 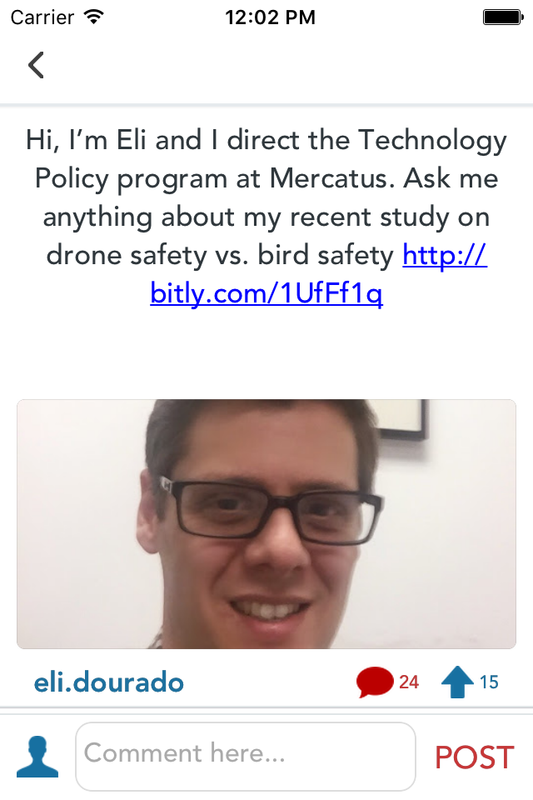 No, I think drones are pretty safe and shouldn't need to be certified. Manned pilots are flying huge aircraft that can take down steel buildings. Simply not the case for smaller drones, not the same safety concerns. @thomas.jefferson: Why do you think Congress set deadlines that FAA stated they would be unable to meet? And what should Congress do in the future to make sure agencies are able to, and actually do, meet deadlines? The problem is not just deadlines. The FAA isn't just late, they are promulgating rules under the wrong section of the law, 333 instead of 332. Congress should be really pissed. Delay is acceptable, defiance is not. @chairman.meow: Any interesting drone legislation that's been introduced in the House recently? Yes, lots. FAA reauth always brings up opportunities to force the agency to move forward on drones. Current bill does some of that. Also some interesting proposals on plane sharing. @hiscock826: Why do you think the government is so afraid of drones? Besides the obvious safety concerns. I am a drone pilot that has registered my aircraft but I still have to drive out of DC to fly it. These rules are killing innovations. I agree the rules are killing innovation. I think the FAA is just super cautious. If they end up in headlines, it is bad news. If drones do amazing things and revolutionize our lives, no one will thank them. So incentive is to slow everything down. @hiscock826: Even if they created another agency like the DMV where people have to get licenses for their drones, do you believe people will follow all the rules? I see accidents on the road every other day. I think it's possible to enforce a few basic rules like "don't fly too close to the path of commercial jets." Beyond that, enforcement is really tough and likely cost-prohibitive. @fogg.mcmahon: What about regulating flight over private property? My ownership ascends up pretty high. Can i shoot RPA trespassers? The 1946 case US v. Causby says basically planes can go over your property as long as they don't interfere with your use of the property. We'll see how courts apply this to drones, but it seems like a decent, flexible standard to me. Shooting hasn't really been litigated yet, but I suspect if you own a lot of land, it's legal to shoot there I general, and the drone is flying low, you'd be within your rights. Not legal advice! @thomas.jefferson: Just fyi, there are two cases that will soon be litigated (that I know of) involving shooting UAS. One man was arrested (KY) and charges later dismissed. That case is now being litigated by the drone operator. Another in CA is also being litigated. Another case with a crop duster found the shooter guilty even though the aircraft was flying right over his house at night. @sam.ward: Is Congress doing enough to prod the FAA into action? I'm grateful for everything Congress has already done, but I would like them to do more. The FAA is being dragged kicking and screaming. We need lots of oversight and fast timelines for implementation. @sam.ward: Does the House FAA bill go far enough? Thoughts on Senate bill? I worry a lot about the safety provisions in the Senate bill. Very overbearing. The House bill does some good stuff, but as an innovation proponent I always want more. @thomas.jefferson: What do you tell people who say "Commercial drones will kill jobs of UPS workers, pipeline inspectors, etc? Drones will replace some jobs (including cell some cell tower inspectors, one of the most dangerous jobs in the US). But it will create tons of new business models. New opportunities for logistics at the local level. What the shipping container did for global trade, drones could do for local trade. @hiscock826: Im sure the FAA is doing the best they can. But innovation is not waiting around for any govt agency. Especially outside of the US. How can US businesses remain competitive in this market with such oversight? This point about global competitiveness is well taken. Canada is governing circles around us. No registration required for hobbyists flying drones up to 35kg. Simple notice and no approval required for commercial drones up to 25kg. @dawson.taylor: You said the FAA is promulgating rules under the wrong section of the law in defiance of Congress. Sounds bad. Could you please elucidate? Dawson, yes. The small UAS rule coming out later this spring is being promulgated under 333 of FMRA, which was always meant to be temporary, rather than 332, which is what Congress intended. Basically they did this because 333 rules out some flight parameters the FAA didn't want o consider (like beyond-line-of-sight). I'm really angry about it, but it's so in the weeds that most people don't get it. @dawson.taylor: Well that's crappy. What's our recourse? I would love to see a hearing about why there are no 332 rules proposed yet. The recourse besides hearings is always reauth. We have a chance this summer to get in all the demands Congress wants to make for the next 6 years. Make sure it's a good one! @dawson.taylor: The line of sight rules strike me as particularly backwards. A) how do you enforce them. B) the whole point of drones is that you can automate their routes and you can see through their cameras and sensors. But we need human eyes on at all times? Yes, plus first-person-view doesn't count as a substitute for FAA, and it's arguably safer, especially at high altitude. @fogg.mcmahon: If my cell phone can screw up an airplane, does an RPA with a wireless connection pose a similar risk? Your cell phone probably can't screw up an airplane. I have been on flights (on Emirates) that even had cell phone use allowed. With modern shielding of electrical components this isn't a serious concern for drones either. @fogg.mcmahon: How do you think we handle commercial space flight? 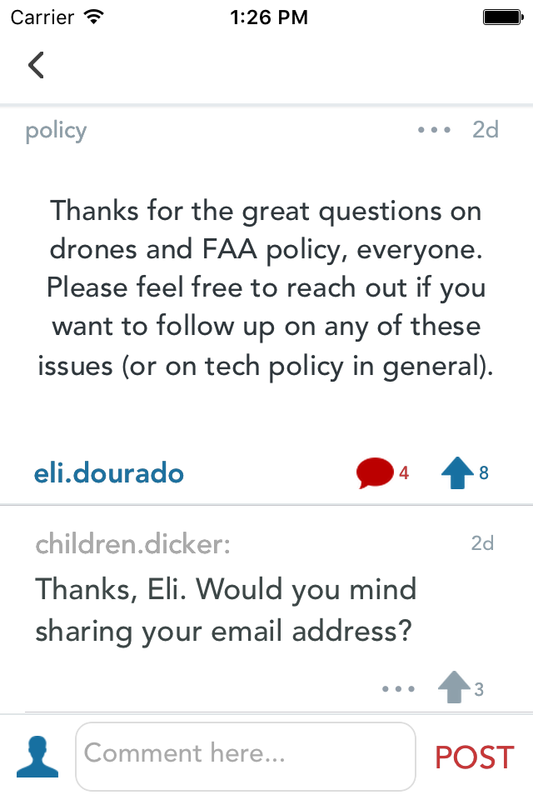 I worry a lot about the FAA screwing up launch requests. In general I think we should do more at NASA and less at the FAA. NASA is really pushing the drone stuff forward too. @catron.brooke: Eli, what are your thoughts on flight-sharing? I was a big fan of flight sharing and hope we can bring it back. It's less safe than commercial flight, but as long as passengers are aware of that, I don't see the problem. Also really hoping someone offers an amendment on supersonic flight over land. 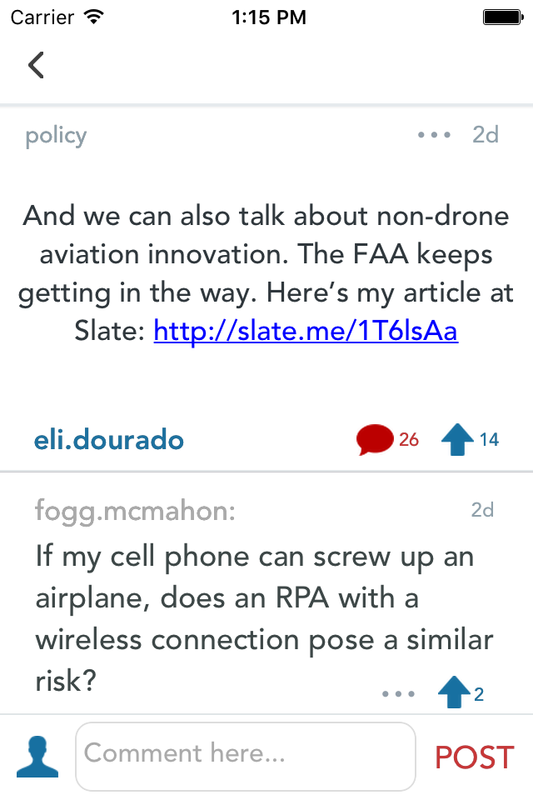 Really the biggest no brainier in policy right now: make the FAA set a noise standard. @floor.buckingham: All these great innovations are cool but what about the environmental impact, like carbon footprint and cleaning up disasters? Or do you believe in do it now ask forgiveness later? Lots of cool opportunities for improving the environment. Drones are being used in some countries to combat poaching. Surveying disaster areas. And delivery drones substitute for delivery trucks—so possibly fewer emissions there. @sam.ward: Do you think the fight over ATC reform will produce any real changes at the FAA? ATC reform is still too modest in my view. We should be trying to move to a more decentralized model like Free Flight or UTC that NASA is studying. @fogg.mcmahon: Does the FAA noise standard affect mil/gov't aircraft? Supersonic flight is banned over land UNLESS you're military/government. No noise standard at all on that that I'm aware of. @sam.ward: Big picture what factors help influence members who "get this"? Seems like this is a big sector with a lot of protected incumbents. Hard to form coalitions to shake things up. I think on the safety side, it's mostly the pilots association and the FAA itself that oppose movement. Drones are safe, not a lot of reason to hold back. Seen more members dragging feet on privacy grounds. And the thing about privacy is that there's nothing new here. It's cameras. We'll get used to it, there are already laws on the books, we can let the courts sort it out. But some members want preemptive privacy regs, which I worry about. @iraqi.tobaccy: Who are the most aviation innovation-friendly Members? Who's the best bet for getting traction on lifting supersonic flight restrictions or allowing flight sharing again of the FAA doesn't do it on their own? I think I saw that Sanford had a flight sharing amendment. Sen. Booker is very good. Sen. Hoeven is pro-drone.